The global fish oil market is a billion dollar industry. Why? Well, omega-3’s and fish oil supplements are considered to have health benefits that include: (i) anti-inflammatory activity; (ii) improved metabolic processes including basic brain and heart activity; (iii) anti-cancer activity; and (iv) anti-depressive activity. As this industry grows so seem to the number of options and different supplements that are available – omega-3’s, fish oils, fish liver oils, shark liver oil – but what exactly IS the difference??? I can honestly say that I’m gill-ty (HO! cheesy pun I know…) of assuming they’re essentially the same thing. I always thought they were sources of polyunsaturated fatty acids (PUFAs) – a vital oil that humans cannot synthesize themselves so they must extract from dietary source. So…. IS there a difference? Well, no better time to ask this question than while sitting next to a 60 MHz NMR spectrometer! It turns out that there are in fact differences between these supplements. They each have their own pros and cons that should be carefully considered when choosing which supplement to add to your repertoire! The first, supplements I studied where the “omega-3s”. According to the label these are made of fish oil concentrate (what?!?! ), PUFAs, eicosapentaenoic acid (EPA) and docosahexaenoic acid (DHA). PUFAs, EPA and DHA are not surprising components; these are the vital oils. EPA acts as a precursor to the eicosanoids, compounds that are involved in important feedback loops including platelet aggregation and white blood cells activation. DHA is the primary component of the cerebral cortex, skin and retina. It is vital for to: (i) maintain proper brain function; (ii) slow the progression of Alzheimer’s; (iii) improve cardiovascular health; (iv) improve the efficiency of chemotherapy drugs; and (v) inhibit the growth of some types of tumors. Fish oil concentrate, as it turns out, are a processed form of PUFAs. They contain the long chain fatty acids, but instead of being in the natural triglyceride form, they are present as the ethyl ester derivative. These are formed through a simple transesterification reaction. This process is done because it renders the PUFAs easier to refine, purify and concentrate. Unfortunately, it also renders the PUFAs less bioavailable. They must first be reverted back to the triglyceride form in vivo before they can be absorbed. Although these ethyl ester derivatives may be more difficult to absorb, the strength in omega-3 supplements is that they are a form of only PUFAs. Naturally occurring saturated, monounsaturated fatty acids, and naturally occurring toxins can be removed before the omega-3 supplement is capsuled. As the majority of oils have been studied at high-field NMR, I wanted to look at these supplements at both 60 and 400 to note any similarities and/or differences between the fields. If we compare the spectra taken at 60 and 400 MHz, there is good agreement with the amount of composition of each sample. Wild salmon oil is a natural source of PUFAs. It is less processed than omega-3′s, it contains added EPA and DHA in addition to the fish oil. Subsequently, in addition to the desirable PUFAs, this supplement also contains an undesirable but naturally occurring quantity of saturated (e.g., palmitic acid) and monounsaturated fatty (e.g., oleic acid) acid. Saturated fats have been shown to increase the risk of cardiovascular disease. Although there is evidence to suggest that monounsaturated fatty acids may reduce inflammation and are beneficial for maintaining normal cell growth, most Western diets contain significantly more omega-6 than omega-3. If this ratio is too high, it is thought to be detrimental. Like the omega-3 supplements, there is good agreement between the 60 and 400 MHz data. 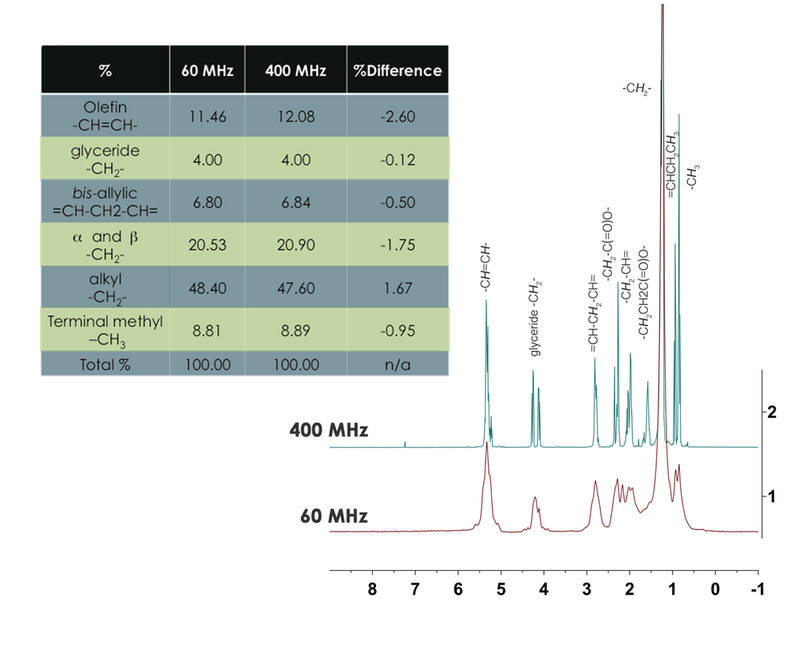 The omega-3:omega-6 ratio can be easily determined in 400 MHz NMR spectra, but unfortunately there is insufficient chemical shift dispersion to precisely determine this ratio at 60 MHz. Regardless, the increased concentration of saturates and monounsaturates can be easily observed through the significantly greater alkyl –CH2– component (~47% cf., 24% in omega-3 supplements) and a higher olefin to bis-allylic ration (1.7 cf., 1.2 in omega-3 supplements). Cod liver oil, like wild salmon oil is a natural source of PUFAs, EPA, DHA, saturated and monosaturated fatty acids. The distinguishing feature from wild salmon oil, is the amount of vitamin A and D3 present. Although below the limit of detection on both the 60 and 400 MHz spectrometers this data was acquired on, the amount of vitamin A approaches the upper tolerable limit for humans. Vitamin A is essential for many functions (e.g., vision), is a fat-soluble vitamin and is known to bioaccumulate in fat tissue. People taking cod liver oil generally are required to regulate and/or limit other sources of vitamin A in their diets. In other words, you should consult a physician before adding cod liver oil capsules to your daily routine. Additionally, as the liver is used to remove toxins there is also the potential for a greater presence of contaminants (e.g., PCBs, PCDDs, PBDEs, MeHg). Like the vitamins, however, if present in these samples they are also of too low of a concentration to be detected by 1H NMR Spectroscopy methods that we employed. Finally, this brings me to shark liver oil. This is often incorrectly classified as a PUFA supplement when there is virtually no omega-3 PUFAs present. A shark liver has a unique composition because it acts as a swim bladder. It is filled with oils that effectively increase the buoyancy of the shark. This oil is almost entirely squalene. Squalene is an essential terpenoid substance that is a precursor to the in vivo development of all steroids. Although there are other natural sources of squalene (e.g., vegetable oil, amaranth), shark liver is the main source. Although squalene possesses a very different bioactivity, its health benefits are similar to that of PUFAs. Squalene is thought to have anti-carcinogenic activity, both in reducing the risk of cancer as well as in shrinking existing tumors. Additionally, it has been found to potentiate chemotherapy drugs. There are two potentially problematic components in shark live oils: pristane, and like in cod liver oil, toxins (e.g., PCBs, PBDEs). While there is no evidence for aromatic protons from PCB or PBDE contaminants at either 60 or 400 MHz, there is an alkyl impurity in the samples we tested. This could be residual pristane. Pristane is a saturated terpenoid substance that is the second most prevalent oil in shark liver. It is known to induce auto-immune disease and plasmacytosis in mice, and has been linked to an increase instance of rheumatoid arthritis in humans. To determine whether this impurity is pristane or a residual solvent a more sensitive technique may be beneficial. So……which supplement should you take? No need to have a roe (HO!) – it is of course your decision! But perhaps the NMReady-60 helped to tip the scales! For more information about the NMReady-60, applications which it is suitable or, you know – just for the halibut (HO!) – please don’t hesitate to contact us!